As the movement for National Improved Medicare for All grows, we need to make sure that Medicare Advantage, which is just a front for the private insurance industry, is not allowed to be part of a single payer health system. Medicare Advantage plans are private health insurance plans available to people who are eligible for Medicare. While the name sounds positive, as it is a marketing term for the insurance industry, Medicare Advantage plans are privatizing Medicare (sending dollars that could be used for care to investor’s bank accounts), preventing seniors who need care from getting it and taking us down a wrong path. Privatizing Medicare, our public insurance: The insurance industry sees the movement for improved Medicare for all growing. As a result they are heavily marketing Medicare Advantage because they see it as the way to survive a single payer healthcare system. 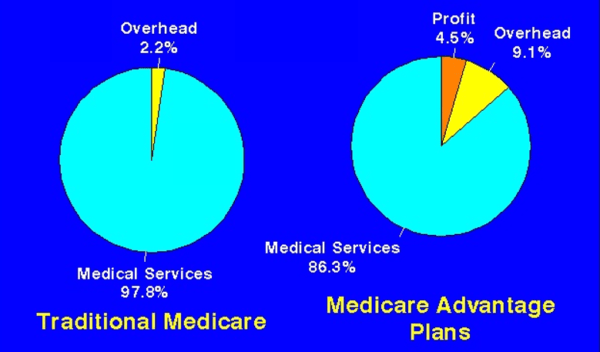 The aggressive marketing of the plans is making Medicare Advantage is becoming a bigger share of the Medicare system, now comprising 34% of Medicare enrollees. Medicare Advantage undermines Medicare and will undermine an improved Medicare for all system. Medicare Advantage plans receive more money from the government per enrollee than original Medicare and they cover a healthier population than original Medicare. With its high overhead and profits, Medicare Advantage wastes dollars that could be used for health care. My sister has an advantage plan. What can she do? Just drop it? She (and you) should lobby the HELL out of your CongressCritters to pass HR676 – Expanded and Improved Medicare for All! After using regular Medicare for a rather minor surgery in 2011 and being shocked at how large the co-pay was (20% of the “charges”) and how obscenely large the phony charges from providers are, I opted for a “free” (no additional premium) Medicare Advantage Plan that paid 90% of those charges instead of only 80%. Alas, after moving to a very rural area, that kind of plan is NOT AN OPTION. For brevity, in the following I shall use the term “RSC” for USAmerica’s corporate, for-profit, remedial sick care as a ‘commodity’ system. 1. Restricted Choice: Unless you have tons of money to pay cash, ALL choice is restricted in the RSC. HR676 would eliminate that and replace it with a system that includes every Health Care provider in the “plan” — well, all but the greediest boutique providers of mostly unnecessary/cosmetic “care” who will continue to only accept “consumers” who have large piles of cash. 2. Meaningless Choice: When I signed up for my current plan and chose one of the only three plans (all priced about the same) that were available at the time. My deciding factor was that the one I chose had the closest clinic to my very rural farm where I could access primary care. Within 3 years they closed that clinic (now it’s a 3 hour round trip to ANY care) and raised my premium by over 200%. 3. Inequitable: If I lived in another part of my state a mere 150 miles away, I would have a choice of 7 or 8 plans at much lower cost with closer access to care. But financial decisions have been made by the RSC that leaves my area with 185,000 people completely devoid of major health care facilities, notably cardiac care. It saves the system a couple million dollars and hell, only a few people a year die from heart attacks here thanks to lack of access to care – a small price to pay in order to cut costs and provide increased profits for the RSC system and its shareholders. 4. Unreliable Coverage: How were they allowed to jack up my premiums 200%? Why didn’t Obamacare protect me? The tactic used was to “Cancel” the plan I was on, force me into the same skimpy coverage under a NEW PLAN NAME with higher co-pays and deductibles and jack up the premium. Unreliable — goddamn right! 5. Unsustainable: As long as the entire RSC is left under the control of corporations whose imperative is “increasing shareholder equity” by showing ever increasing quarterly profits, there’s no way to rein in costs. The U.S. Taxpayer is expected to continue to pay 60% of the costs and have little or no control over how they are determined. 6. Inefficient: See number 5. Profits up and down the corporate chain gobble up at least 30-40% of total “costs”. 7. Profit Driven: KAISER IS NO LONGER AN EXCEPTION! that’s the corporation that is gouging me to provide substandard “care” at ever increasing cost! And it’s not just the providers and insurance corporations, the entire system is affected. For a more complete discussion of how deeply the profit motive perverts “care”, please see my article at WriterBeat: “Profits Must Not Drive Health Care”. 8. No innovation: The entire RSC system is driven by the drug pushers in Big PhRMA, hospital corporations and their executives and the surgeons/administrators who run the AMA. This perversion of care into defaulting to drugging folk and/or cutting them open and stitching them up is VERY profitable but completely ignores entire entire areas of preventive, holistic care and Functional Medicine. The negative incentive that permeates the entire RSC is that “Cures don’t increase profits”! 9. Unaccountable: For profit corporations are only “accountable” to their major shareholders. For instance, “malpractice insurance” premiums is another profit center for insurance corporations in the industry that WE the sick care “consumer” eventually pay for. 10. Unethical: Since the entire RSC is profit-oriented first, unethical is their foundational premise. Let’s briefly talk about “costs”, an underlying lie that underpins delivery of “care” in the entire FRAUDULENT RSC Industry? There was an OUTSTANDING COVER article published in Time Magazine in 2013 by Steven Brill titled, “Bitter Pill. Why Medical Bills Are Killing Us”. This article described the “Chargemaster”, a Top-Secret and ever pliable “list of charges” that the bean counters and CFOs working at the RSC provider corporations use as the basis of their fraud. If you’re among the “fortunate few” who have a stack of these on hand, follow this discussion using one of your “medical bills”. I’m going to use the large stack of bills I got from Kaiser that totals around $195,000 (Chargemaster) for treatment of the heart attack I suffered from June 9 through the 10th (it took them 11 hours to get me to care) that was in no small part caused by decisions made in 2012 at another hospital in order to serve their profit-motive and left me with an occluded main artery in my heart. Starting in the left hand column there is usually a column of incredibly high numbers that are labeled something like “Amount Provider Billed the Plan”. This is the completely inflated, bullsh*t “cost” pulled from the “Hospital/Medical Center” corporation’s “Chargemaster”, that secret list of “charges” for “procedures” that even most doctors don’t have access to (or care about), is ever changing (increasing) and is the amount that SOMEONE WHO DOES NOT HAVE INSURANCE IS CHARGED! Then is another magic column, “Amount the Plan Approved”. This is another bloated but usually*** much smaller “cost” that allegedly the insurance provider has “negotiated” with the provider to be the amount they agree to pay. Of course, in reality, the “negotiation” is usually one-sided, the insurance corporations (that will be eliminated in HR676) set their profit goals (add 20-40% for profits and overhead) and then determine the minimum they’re likely to have to pay in claims once their mechanisms of denial of care fail to block payment and adjust what they will pay accordingly to maintain high rates of profit and overhead. Then is the “Plan’s Share” – the amount of that inflated “cost” that they will pay to provider. And of course, after that is the nearly ONLY IN AMERICA(sic): YOUR SHARE. This is the punitive, Calvinist “CO-PAY” that’s designed mainly to deter you from using Health Care until it’s often too late to alleviate a minor condition with minimal interventions but rather one is forced to avail oneself much later with expensive, extraordinary and extremely profitable remedial “care” for a much more critical, often life-threatening condition. HR676 would eliminate this column. *** I’m still trying to follow up on ONE charge in my stack of bills. Thanks to missing some important symptoms in May of this year, my massive heart attack (and overdosing me with a blood pressure medicine in my 2nd day of the stay) resulted in a 6 day stay in the hospital in June. There is a charge in my bills for “Room and Board” that defies the above pattern. Amount Provider Billed the Plan is $9,580 and the Amount the Plan Approved is FORTY FOUR THOUSAND SEVEN HUNDRED AND SIXTY SIX DOLLARS ($44,766) with a WHOPPING “Co-PAY” of $1,160 that I allegedly OWE!! Every other item in the bills is “discounted” by at least 40% between the 1st and 2nd column so this one should have been “Amount the Plan Approved” at around $5,800 with my co-pay calculated to be about $150. I’m still trying to get an answer from the Greivance Dept as to WTF that is all about! Last week I found an embedded tick in my side, the second one of the week. I was unfortunately not able to successfully pull it all out, so I went into urgent care to have them get the head out, as it was in a tough to reach location. When I walked in, I told them why I was there, to have the tick head removed. I got checked in, they took my vitals, and the doctor came in and the first things she said was “We can’t do that here.” Well, that would have been good to know before I just wasted 30 minutes of my time waiting and filling out forms. And of course, they are going to bill my insurance, which I will spend more time fighting it than it is worth to me – but I must do so out of principle.